The weather had remained dry for over a week, a rarity these days, and latterly the temperature had started to creep into double figures! 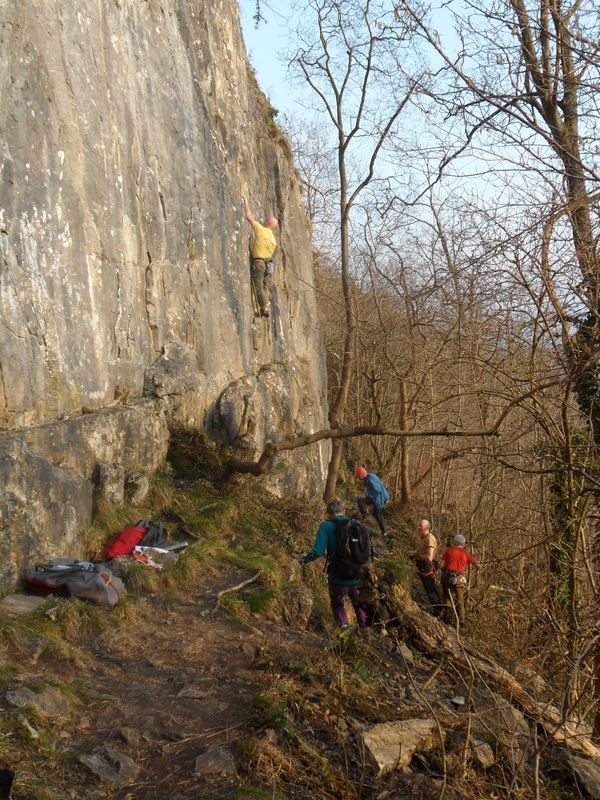 Most days, whilst it was still cold, there was lots of bouldering activity up at Craig Y Longridge. Almost a party atmosphere at the busy weekend. ….from the easy to the hard…. The forecast for Tuesday was even better with the promise of warm sunshine after a frosty, misty start. Motored leisurely over to Settle with the temperature showing only 3degrees. When we arrived the mist was still down, so we retired to the cafe for coffee until hopefully things improved – had we made a mistake, or rather had the forecasters?? No shortly before 12am the sun appeared and it was a rush up to the crag – Giggleswick Scar South. This is a low lying, limestone, scar just above the road and golf course. It is well sheltered for visits in the winter and gets all the sun going after late morning – perfect. The parking lay-by was already full, partly because of some selfish parking, and from there it was a simple stroll up to the climbing areas. Click on the picture below and magnify to read about the scar in general .. There has been climbing here since the 70’s when a number of traditional routes were done by likes of Allan Austin and friends. 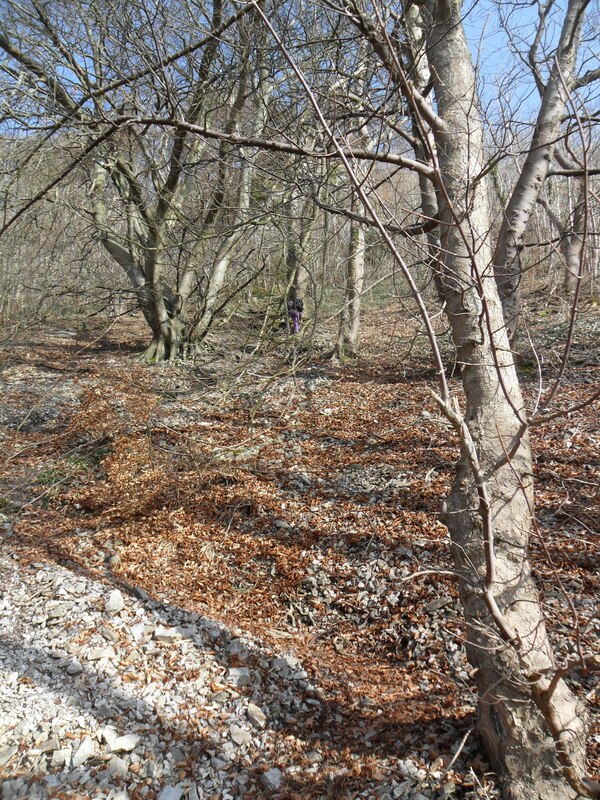 The crag subsequently became unpopular and slipping into obscurity as the vegetation took over. 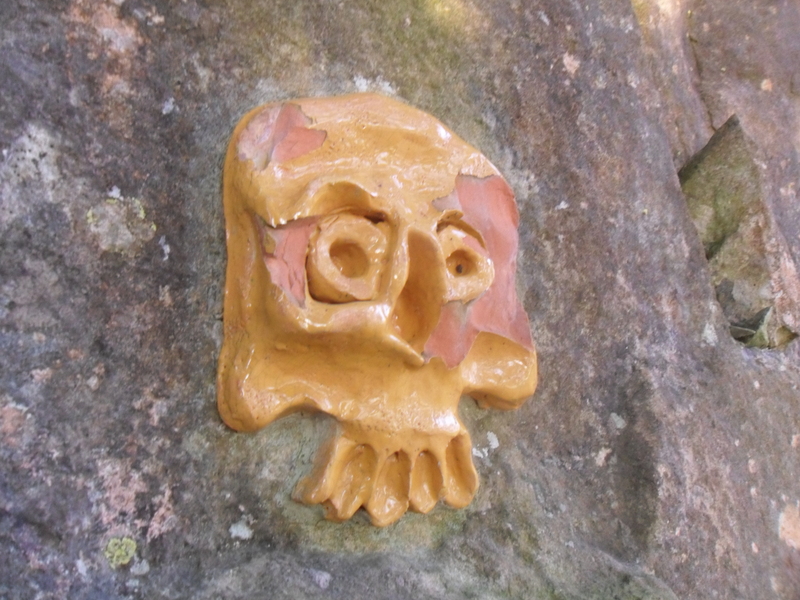 However in the 90’s further exploration and extensive cleaning in the search for new rock, along with the use of bolt protection on the blank walls, has brought new life to the place. Sports climbing became of age. At first the older recorded routes were spared the bolt gun and new harder routes were created in the blank spaces between. This meant that some of the classic, albeit, easier lines were ignored and unclimbed. Inevitably as exploration continued this distinction became a little blurred without any great detriment to the crag – some would use the term improvement; purely in the climbing experience. Climbers were already swarming up the routes in the sunshine as we walked along the edge to our chosen sector at the far left of the escarpment. 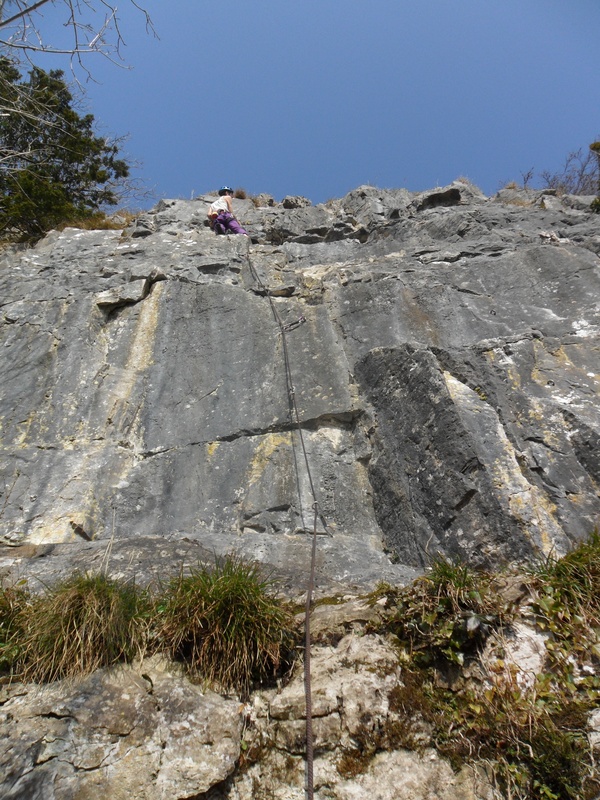 The area we arrived at is called Anchor Buttress after one of the original climbs. The steep face is under 20m height but is clean and fairly solid with relatively lower grade routes. Since our last visit here several “new” routes have been cleaned and bolted mainly based on old 70’s lines. This gives us some extra purpose for the day to climb these old classics in a modern bolted style. Now it just so happens today that I’m climbing with Dave Miller who actually shared the first ascent of one of these with Allan Austin in 1972. To be precise March 5th – exactly 41years ago to the day! We hadn’t realised that coincidence when we set off. Dave high on Bramble Jelly. 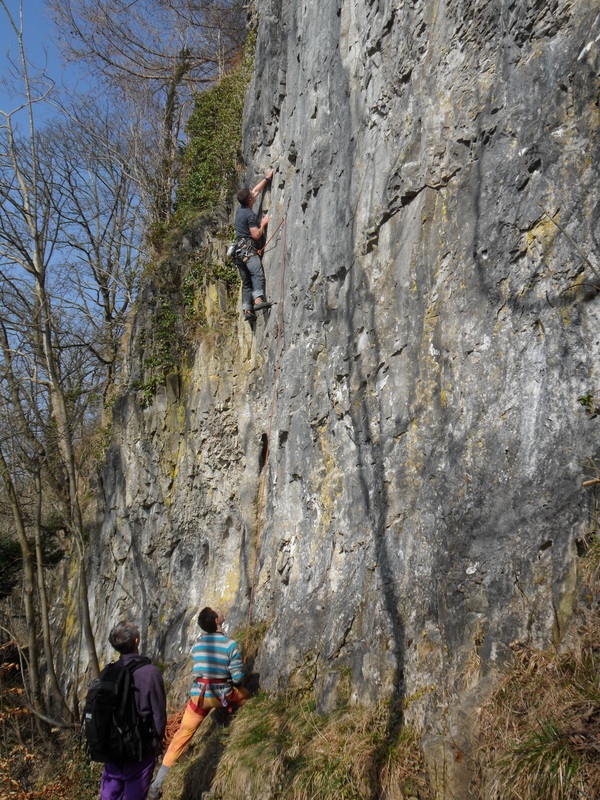 The afternoon was pleasantly warm so we continued climbing the routes on the buttress till well after 5pm. On our way out we came across more teams including Dave Cronshaw and Angela Soper who had also been active here in the 70’s – yet more coincidences. Great to see these people are still active and enjoying their sport. Perhaps the modern bolting policy here is helping! 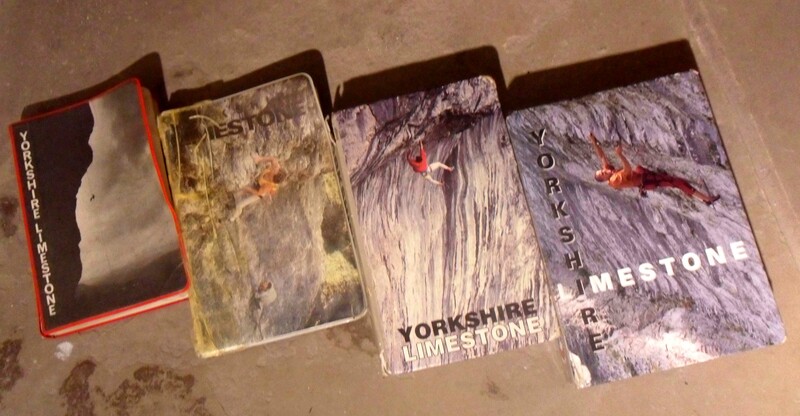 This entry was posted in Bouldering, Climbing, Yorkshire Dales. and tagged Bouldering, Climbing on March 7, 2013 by bowlandclimber. To bolt or not to bolt? I see no problem on blank sixty foot limestone walls like that, but not where the limestone has more character, Trowbarrow for instance. It will always be a subjective judgement, and I don’t think there can be a set of rules written. I have just read Joe Brown’s Hard Years, and I was a bit surprised at his frequent use of pegs, and often he doesn’t say whether they were just for protection or for aid, but this was of course on the pioneering of new routes at the cutting edge. I always felt there was a case for more bolts on belay stances which would not interfere with the purity of leading a route with traditional gear, but giving the climb a greater measure of sensible safety. I’m not wanting to get into the ‘bolt or not to bolt’ debate. One would never place bolts in Stanage gritstone or the like. I don’t subscribe to the thin edge of the wedge argument. I’m optimistic that young climbers of today will respect traditional British ethics. Most of the youths I talk to are impressed with the routes of old and aspire to similar heights. 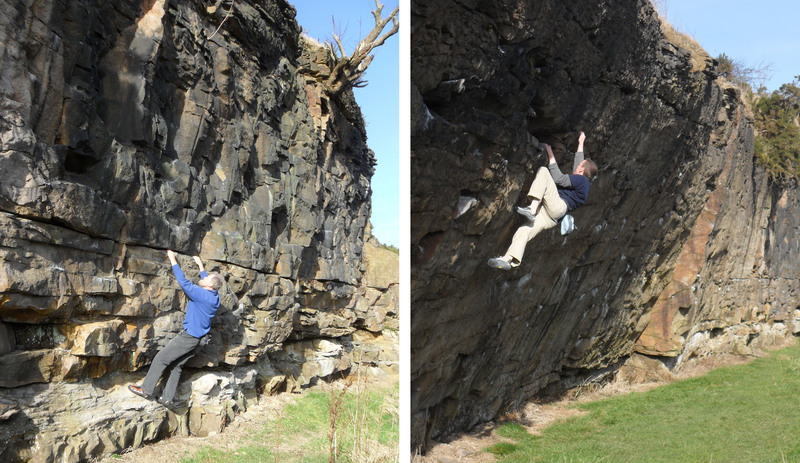 Of interest the ‘old timer’ Dave Miller enjoyed re-climbing ‘his’ route with bolts. We probably wouldn’t have done it otherwise. But the change of name was a different matter! Joe Brown was a brilliant climber but did resort to the peg readily – and often for aid, not always declared! Who could criticise him in his day with limited protection possibilities.